Jupyter Notebooks are a powerful way to write and iterate on your Python code for data analysis. Rather than writing and re-writing an entire program, Jupyter Notebooks allow you to write code in separate blocks (or “cells”) and run each block of code individually. Then, if you need to make a change, you can go back and make your edit and rerun the program again, all in the same window. Jupyter Notebook is built off of IPython, an interactive way of running Python code in the terminal using the REPL model (Read-Eval-Print-Loop). The IPython Kernel runs the computations and communicates with the Jupyter Notebook front-end interface. It also allows Jupyter Notebook to support multiple languages. Jupyter Notebooks extend IPython through additional features, like storing your code and output and allowing you to keep markdown notes. If you’d rather watch a video instead of read an article, please watch the following instructions on how to use a Jupyter Notebook. They cover the same information. To launch a Jupyter notebook, open your terminal and navigate to the directory where you would like to save your notebook. Then type the command jupyter notebook and the program will instantiate a local server at localhost:8888 (or another specified port). A browser window should immediately pop up with the Jupyter Notebook interface, otherwise, you can use the address it gives you. The notebooks have a unique token since the software uses pre-built Docker containers to put notebooks on their own unique path. To stop the server and shutdown the kernel from the terminal, hit control-C twice. Now you’re in the Jupyter Notebook interface, and you can see all of the files in your current directory. All Jupyter Notebooks are identifiable by the notebook icon next to their name. If you already have a Jupyter Notebook in your current directory that you want to view, find it in your files list and click it to open. To create a new notebook, go to New and select Notebook - Python 3. If you have other Jupyter Notebooks on your system that you want to use, you can click Upload and navigate to that particular file. Notebooks currently running will have a green icon, while non-running ones will be grey. 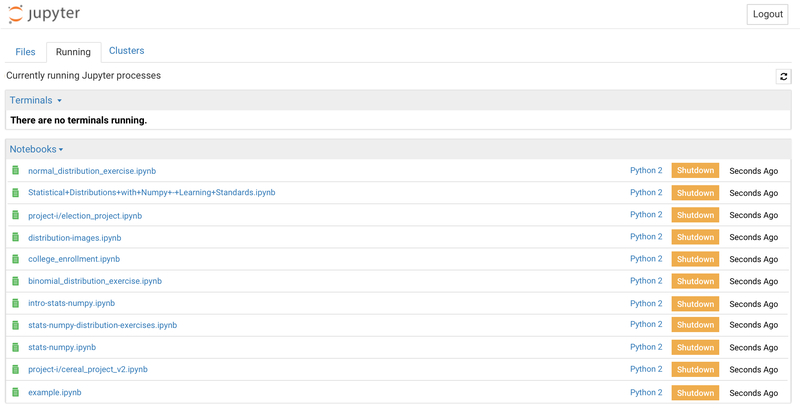 To find all currently running notebooks, click on the Running tab to see a list. When you open a new Jupyter notebook, you’ll notice that it contains a cell. Cells are how notebooks are structured and are the areas where you write your code. To run a piece of code, click on the cell to select it, then press SHIFT+ENTER or press the play button in the toolbar above. 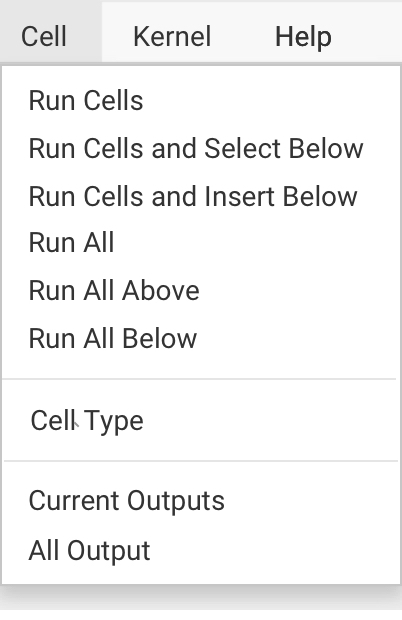 Additionally, the Cell dropdown menu has several options to run cells, including running one cell at a time or running all cells at once. After you run a cell, the output of the cell’s code will appear in the space below. To stop running a piece of code, press the stop button. To create new cells, use the plus (+) button in the toolbar or hit SHIFT+ENTER on the last cell in the Notebook. To cut, copy, delete or just generally edit cells - select the cell you want to modify and go to the Edit button in the navigation bar to see your options. In addition to running lines of code, you can also include text-only cells that use Markdown to format and organize your notebooks. When you create a new cell, it will default to being a Code cell. 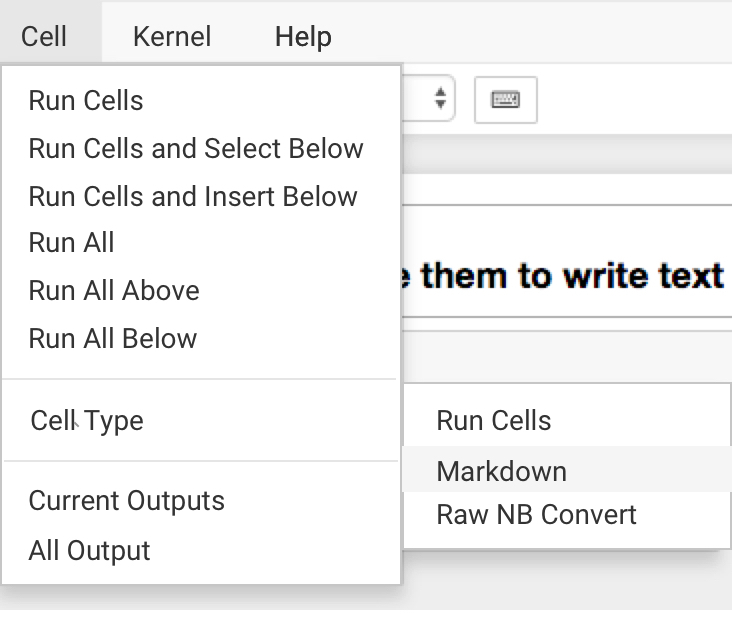 To create a cell that uses markdown, click on the Cell menu from the navigation bar, scroll down to Cell Type and choose Markdown. Occasionally, you might need to restart the kernel. Head to the Kernel dropdown and hit Restart. 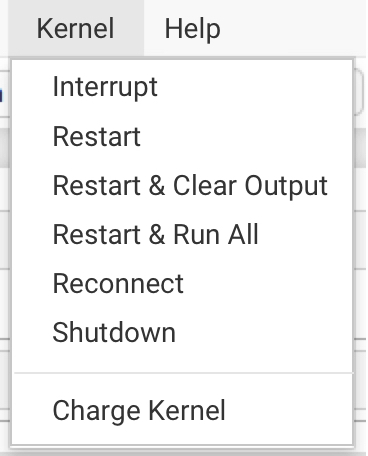 To shut down a kernel, you can click Shutdown, which will have a dialogue process asking if that’s what you would like to do. To force an immediate shutdown, go to the File dropdown and click Close and Halt and the browser window will close itself. Restarting and shutting down kernels will affect your variables, so be careful. 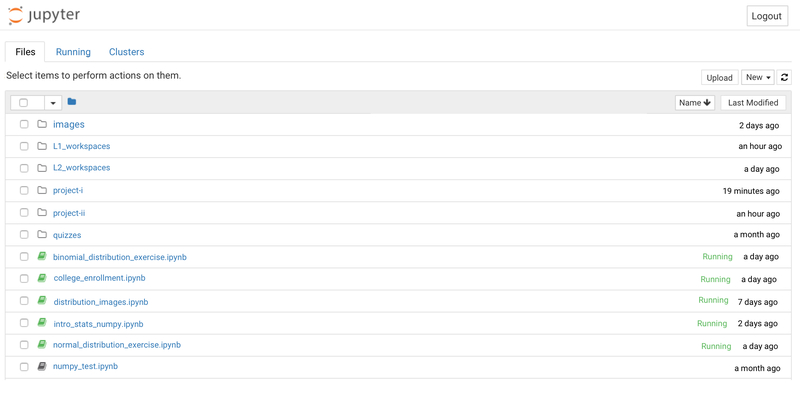 In the Help dropdown, you’ll find useful information such as keyboard shortcuts as well as links to different documentation for modules such as Numpy, SciPy, and Matplotlib. The toolbar has several shortcut buttons for popular actions. From left to right: save, add a new cell, cut selected cells, copy selected cells, paste cells below, move selected cells up, move selected cells down, run, interrupt the kernel, restart the kernel, a dropdown that allows you to change the cell type, and a shortcut to open the command palette. Jupyter Notebook files are saved as you go. They will exist in your directory as a JSON file with the extension .ipynb. You can also export Jupyter Notebooks in other formats, such as HTML. To do so, go to the File menu, scroll down to Download as and select the type of file you’re looking for. A popup will appear asking where you would like this new file to download. Once you’ve navigated to the appropriate directory, click Save and Checkpoint. As we’ve seen, Jupyter Notebook files are very useful. Its interface allows you to navigate using your mouse with dropdown menus and buttons, or by keyboard shortcuts. They allow you to run small segments of code at a time, save them in their current state, or restart and have them return to their original state.In addition to running code, we can also use markdown to neatly organize our notebooks so they are presentable to others. If you’re interested in learning more about Jupyter Notebooks, read their documentation. To try out a notebook in your browser, go to https://try.jupyter.org/.